William's poetry may be bloody awful, but the figure is bloody good. Barely 200 years old, Spike is also known in vampire circles as William the Bloody - earning his nickname by torturing his victims with railroad spikes. As a British vampire with a punk rock attitude, Spike comes to Sunnydale to tap into the evil energy emanating from the Hellmouth. Ah, Season 2 Spike. Pre-chip. Back when he was a threatening character for an entirely different reason. 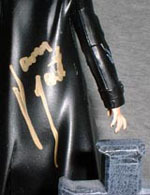 Originally, Spike (along with his girlfriend, Dru) was intended to appear in one or two episodes before getting dusted. However, they made such an impression on Joss Whedon (and on Buffy's audience) that they became recurring characters and a major threat throughout the season. 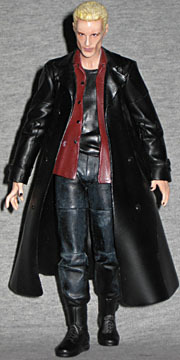 This action figure was originally an exclusive from Fandom.com, a company that went out of business between the time that they advertised the sale of Spike and the date of delivery, leaving a lot of collectors in the lurch. Fortunately, Moore Action offered the fig for sale through the Collectors' Club; unfortunately, there were more members of the club than there were figures available, so some people were still shut out. Due to that, Spike runs a pretty penny these days. It's kind of a running gag in Buffy that people think Spike is a Billy Idol wannabe, but this figure definitely doesn't convey that in his clothes. (Anyway, it's more about his hair.) He's dressed here in his standard "uniform" - black boots, black pants, black coat, red shirt, and black tee beneath. Not a wildly outlandish look, by any means: you could see this just walking down the street anywhere, not just someone cosplaying at a convention. But by golly, that's what Spike wears on the show, and so he's got it here. There was also a variant Spike released; Vamp Spike. Yes, just like Series 1's Vamp Angel. Spike's always been kind of a follower, after all. The variant turned his red shirt black, his skin pale, and his hands more claw-like. And of course, let's not forget the "game face": he'd have to be all vamped out, wouldn't he? The regular figure has a very good likeness, and even under the make-up, you can tell who he's meant to be. Also available directly from MAC, Vamp Spike sold out just as swiftly as before. Articulation on both figures is the same - neck, shoulders, elbows, wrists, hips, thighs, and knees. He's striding forward, with the heel of his left foot just lifting off the ground. While he may look very cool, this makes it rather hard to get him to stand for any length of time; Spike's always tipping forward or falling back. 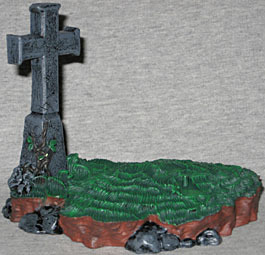 To help keep him up, he's got the same type of sculpted graveyard base as his Series 2 fellows: dirt, stones, roots, grass, and a tombstone from the ground up. Spike's tombstone is a large cross, oddly enough. Oddly, though, he stands better without the base than with it. 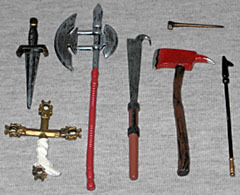 Both Spikes come with a nice selection of weaponry: his titular railroad spike, the cross (wrapped for protection) he held once held against his girlfriend, an axe, an oversized dagger, a billhook, the poker from a fireplace, and polearm. On the downside, his hands aren't molded to accommodate any of these implements. If you want him to hold anything, break out the blu-tac. One last picture: James Marsters was one of the special guests at Wizard World 2001. Rather than something boring like, say, a picture or a comic, I figured I'd have him sign his tiny plastic double. Being the staunch opener that I am, I got the signature on the back of no-vamp Spike's coat. From the front the figure looks as he does at the top of the page - just like everyone else's. Turn him around, and he's one-of-a-kind. I used matte sealant to keep the ink from wearing off. He's got a few shortcomings, but Spike's still a good figure (if you can get him).